Given how much attention the vibrant cover of A Ruin of Shadows has received, it seemed high time to feature the creator of the cover art, Emily Cheeseman. Cheeseman is an artist and the author and illustrator of the comic adaptation Gawain and the Green Knight, available both as a webcomic as well as an exquisite hardback. Check out her amazing portfolio and follow her at @emcheeseman. When you were interviewed in 2016 by muse’s milk, you mentioned five more book concepts in the works. Have any of those since come to pass? Can you tell us about one that you are still working on? Oh boy. Ask me again in a year or so. “5” might have been an exaggeration, but I always have a handful of projects simmering on the backburner in various states of development. One project I can officially mention is a graphic novel I’m co-creating with Kate Sheridan (@killswitchkatie) about a veteran knight, an amateur thief, and the shenanigans that ensue. We don’t quite have our elevator pitch worked out yet, but I’m really excited about the story as well as the opportunity to collaborate with a friend and fellow artist! You mention taking a lot of inspiration from stories and fantasy. Any favorites? I pull a lot from western fantasy and English folklore, mostly. Me and Robin Hood go way back. Lord of the Rings is an easy one, Disney’s Sleeping Beauty and The Hunchback of Notre Dame have been favorites since I was a kid. I’ve always been interested in storytelling as a thing in general — my best friends are people I’ve collaborated with or bonded over a story with, in one form or another. D&D’s a huge source of creative energy and inspiration for me, too — the majority of my mysterious aforementioned backburner projects trace their origin back to D&D. The 1998 miniseries starring Sam Neill. It’s the perfect lazy weekend marathon. It’s lighthearted but dramatic, tragic, the soundtrack is great — I didn’t know it existed until my girlfriend and I went on an Arthurian film adaptation bender a few years ago. It’s an instant favorite. You’re clearly into D&D, as evidenced by your twitter feed. What character class is your favorite to play, and what do you think you would be in real life? I played a paladin for years — you know by now I’ve got a thing for knights. Currently I’m playing a warlock who made a pact with a witch queen in exchange for magic powers (as you do) and he’s a bit of a wild card. Hangs out with faeries. 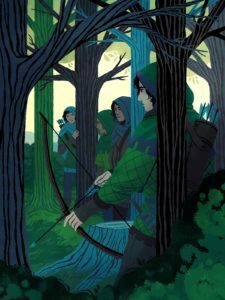 As for me personally, I’d be a ranger — archery is very heroic. Plus: hooded cloak. As a comics writer/designer, what usually comes first for you: the words and story, or the images? The story. I’m a big picture person, and usually it’s the overall concept that I latch onto before the imagery, or the details. My process has always been pretty organic and nonlinear, with a lot of moving parts — but generally my starting point is “what if I made a story about X?” and the rest of the process is figuring out how. Obviously, I loved working with you on this book cover. What do you love about commission work, and what are some of the challenges? How do you balance commission work with your own projects? It’s a tricky balance! I work full time as a graphic designer, and divvying up my evenings between client work and personal work (or, you know, video games) takes some discipline. I’m the type of person that can’t get anything done without a deadline, so I try to keep as rigid a schedule for my personal stuff as I would for client work. I’m usually never short on prompts for what to draw since I have such a huge backlog of projects, but commissions can be a nice break. 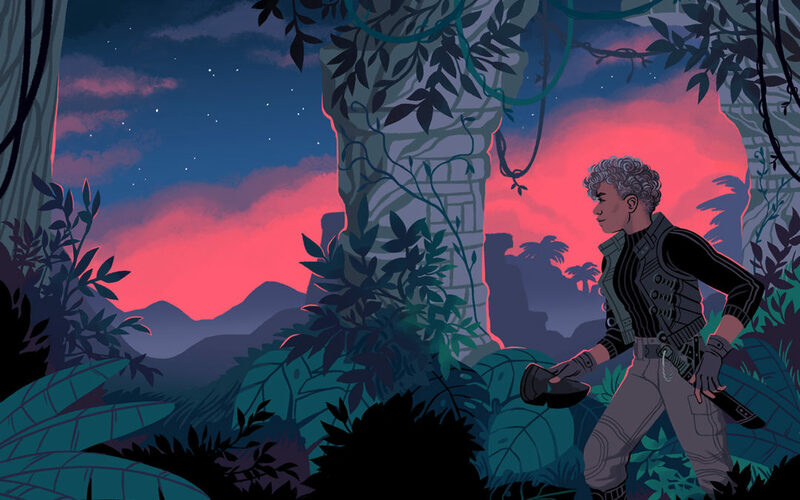 Drawing stuff for other people can bring fresh ideas or push me into genres I might never have explored otherwise — the illustration for A Ruin of Shadows is a perfect example, really! How much of your artwork is created digitally versus traditionally? I keep a sketchbook for planning projects, hashing out images and thumbnailing comic pages – usually the first step I make toward anything is on paper, but the rest is 100% digital. I’m much more confident artistically when I have the ability to alter colors, warp anatomy, etc. with the use of digital tools, so I’ve never quite taken to traditional media for finished work — but I do feel that keeping a sketchbook is a really valuable habit, and doing that initial step on paper helps preserve that loose, organic quality that can sometimes get lost in digital work. A silly question to finish us off: You go to a store and come home with three things that weren’t on your list. What did you buy? Snacks. I am a master snacker. I impulse buy fruit, too — I never remember what’s in season and then I’m utterly caught off guard by how desperately I need two pounds of strawberries. Need your own copy of A Ruin of Shadows with its lovely cover? Buy directly from the publisher here, or from the ebook retailer of your choice here. 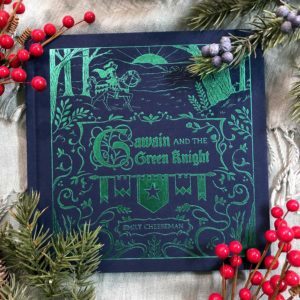 Also, check out Cheeseman’s shop for Gawain and the Green Knight, as well as prints, enamel pins, and more.